Coming to us LIVE on January 3rd, 2015, from the MGM Grand Garden Arena in Las Vegas is UFC 182. The main event features a match that world has been patiently waiting for ever since these two brawled on stage giving us a slight preview for whats to come. 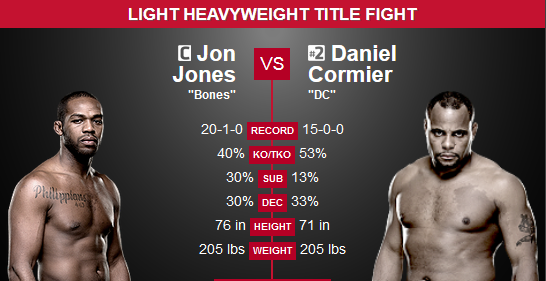 Jon “Bones” Jones will square off against Daniel “DC” Cormier. Both fights have similar fighting style with slight variations in the techniques they use. Wrestling is the common characteristic between these two with no advantage to either fighter. I understand the Jon Jones has the body of work equal to that of no one, but Cormier hasn’t lost and doesn’t plan to. Lets break it down. Daniel Cormier is an absolute beast. He is is built like an industrial concrete building that would take explosives to take it down. Along with his stature comes his olympic wrestling technique. Typically you can use a winning streak to determine a fighters a momentum s but Cormier hasn’t lost which makes it difficult to say it really works in his favor! Lets quickly attack his weakness, submission and submission defense. Typically Cormier can control the fight with his elite wrestling skills if on the mat but his opponent this week isn’t just any other guy. Jones has jiu-jitsu skills second to few and could take advantage of Cormier’s lack of experience of possibly being on his back or in a vulnerable position. Cormier has explosive striking skills that aren’t advertised as much as they should be. One possible fight plan that Cormier might bring to the octagon is using his elite wrestling skills to tire or expose the possible lack of conditioning on the side of Jones then bring the fight to their feet and try to end the fight with an explosive knock-out. Even with a bigger body, I think that Cormier might have the speed advantage. If I were to give Cormier some advice, it would be to go at Jones from the sounds of the bell. Even with all of the acrobatics of Jones, he still works on a rhythm. Cormier needs to disrupt the time by moving, shooting, and closing the gap between the fighters when standing on their feet. Cormier can win this fight, and at only +140, Vegas thinks so as well. How much can you possibly say about a guy who is arguably the best pound-for-pound fighter in the world that already hasn’t been said? He is quite simply a freak of nature. The athleticism Jones shows in the octagon is unlike any fighter right now in the UFC and it makes all of his skills just that much more deadly. Not only does Jones have long arms and legs coupled with speed and aerobatics, his wrestling skills are only second to the man that he’ll be starring in the eyes comes January 3rd. Even with the mental strength that Jones encompasses, he needs to realize who he is fighting. Cormier is no joke, and if Jones approaches him as just another guy, he’ll get thrown around like a rag-doll. On paper it looks like Jones should be able to handle Cormier and begin preparation for the next guy, but that is the reason they fight. Jones has a longer reach, younger, taller, and just has a overall better offense. That’s why I believe Jones will win this fight with his defense. Cormier is going to come at him will a storm of offense from the bell and if Jones can weather the initial barrage, he’ll be able to tip the scales heavily in his favor. Cormier has a plan and if Jones can play a version of rope-a-dope and confuse Cormier in an odd way, Jones will be able to unleash everything we’ve seen and more. Jones is going to want to keep his distance from Cormier at all times in the fight. Cormier will be trying to get in close, if Jones can use the advantages he has to keep Cormier at a distance I believe it will tire Cormier. My advice for Jones would be to keep Cormier at a distance with your legs. Disrupt everything Cormier is going to want to try to do and make him completely change his fight plan. This is going to be one hell of a fight. Both of these fights have many of the same skills and will ultimately come down to who makes the first mistake. I believe the athleticism of Jones is going to be the deciding factor in this fight. I know the popular pick is going to be be Cormier because of the wrestling skills and the bull-like fighting style but Jon Jones isn’t like any other fighter in the world. Jones will be able weather whatever barrage of punches and takedowns Cormier comes out with and then finally be able to turn on the offense. Jones has a better offense than Cormier and it’ll show on Saturday night. Jones will land a series of significant strikes and then finish him. Prediction: Jon “Bones”Jones by Third Round T/KO.